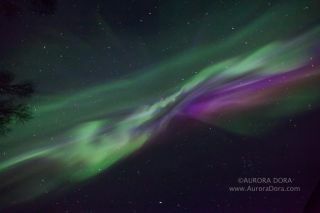 Astrophotographer Dora Miller sent in a photo of an auroral display over Alaska, taken April 20, 2014. Miller is based in Talkeetna, AK. The northern lights dance in a breathtaking display of purples and green in these stunning images by a night sky photographer in Alaska. Astrophotographer Dora Miller of Talkeetna, Alaska captured the dazzling aurora images on April 20 during a nighttime photo session that she won't forget anytime soon. Astrophotographer Dora Miller sent in a photo of an auroral display over Alaska, taken April 20, 2014. The particles are drawn to Earth's polar regions by the planet's magnetic field resulting in aurora borealis, or northern lights, and its southern counterpart the aurora australis, or southern lights.